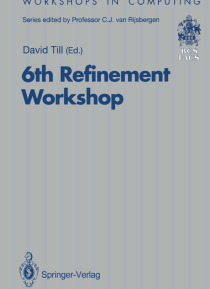 The Sixth Refinement Workshop took place at City University in London from 5th to 7th January 1994. The present volume includes all of the papers which were submitted and accepted for presentation, together with two papers by invited speakers. The workshops in the series have generally occurred at one year intervals but in this last case a two year period had elapsed. These workshops have establis… hed themselves as an important event in the calendar for all those who are interested in progress in the underlying theory of refinement and in the take-up by industry of the methods supported by that theory. One of the proposed themes of the sixth workshop was the reporting of successful adoption in industry of rigorous software development methods. The programme committee was perhaps slightly disappointed by the response from industry to the call in this respect. However, the recent period could be characterised as one of consolidation, when those companies which have made the decision that formal development methods are important to their business have been adopting them where appropriate and finding them to be worthwhile. On the other hand,. the difficult economic climate which exists in most parts of the developed world is perhaps not the context within which companies still dubious about the benefits are goil'\g to opt for making major changes in their working practices.